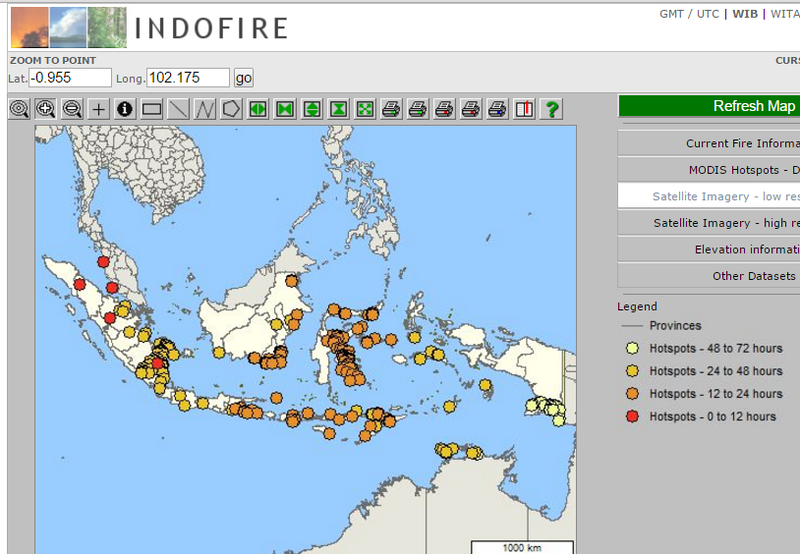 I'm Curious Too: How Much Carbon Did The Indonesian Fire Emit? 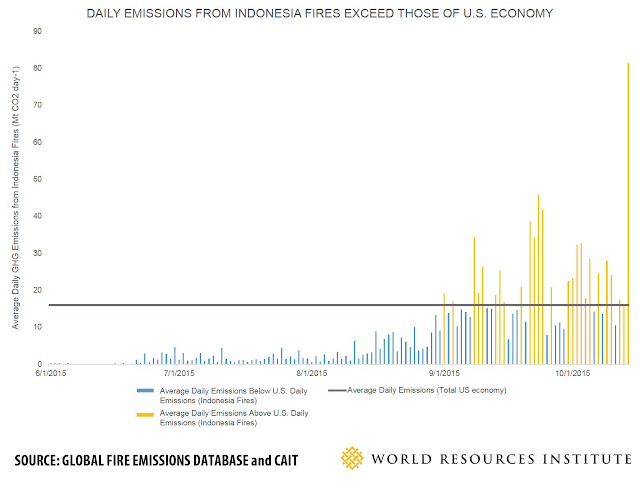 How Much Carbon Did The Indonesian Fire Emit? Last month, palm oil concessions and small farmers in Indonesian began their annual land clearing and burning activity to open up new land for the new season, and the result was a devastating, month-long haze that blanketed neighboring Malaysia and Singapore. Haze, as we know, is made up of dust particles, greenhouse gases, and carbon. Lots of carbon. According to the World Resource Institute, there have been close to 100,000 forest fires in Indonesia in 2015. Together these burning resulted in habitat loss for wildlife, critical haze problem, and of course, pollution. 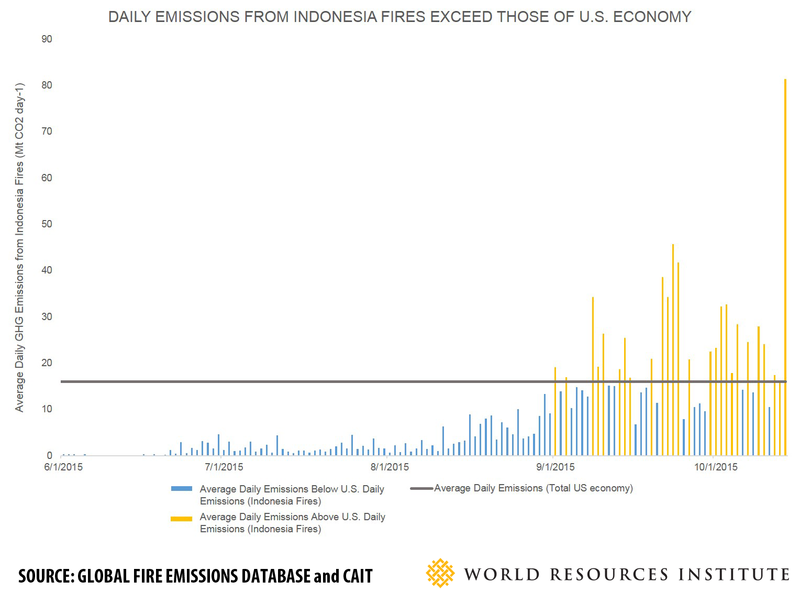 In fact, since the forests in Indonesia began burning in early September, the average daily carbon emissions from the fire have surpassed that of the U.S.A, and at one point, doubled the average daily emissions from the entire U.S. economy. Which means that the forest fire in Indonesia last month has pumped more carbon into the atmosphere than all the factories and cars and burning in the U.S. combined. 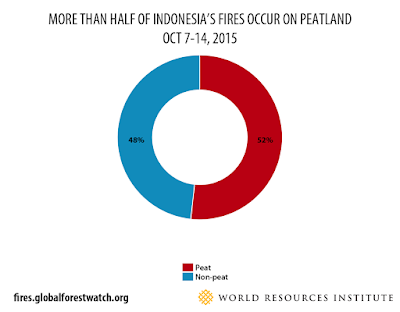 What's even more worrying is the fact that more than half of the fires that occurred last month happened on peatland. Peatlands are actually wetlands with thick water-logged organic soil layer that contains dead plant material. The soil contains a much higher concentration of carbon than ordinary land, accumulated over thousands of years. 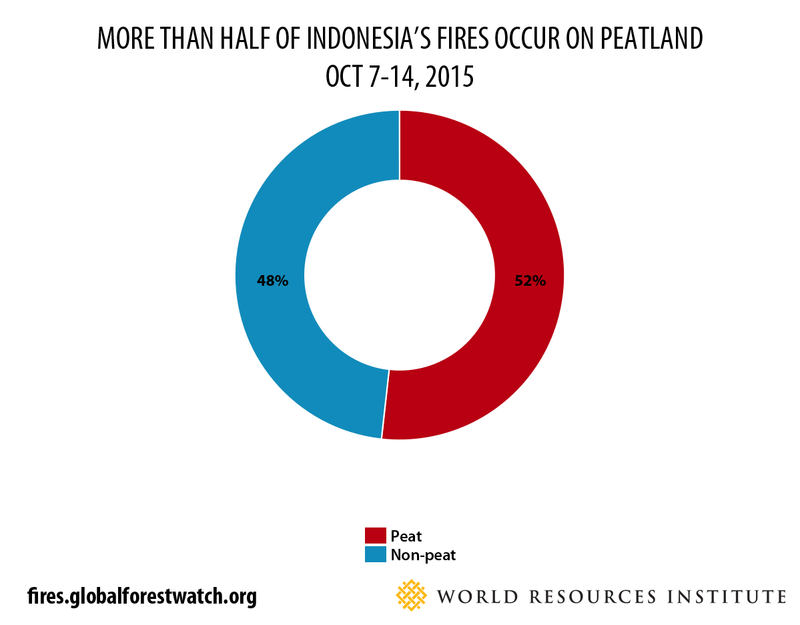 Setting fire to peatlands is more deadly than burning other types of land. Putting that into perspective, burning activity releases methane, a greenhouse gases 21 times more potent than carbon dioxide. But peat fire releases 10 times more methane than fire occurring on other types of land. This is depressing, considering that we're living in an era where most people are erudite enough to understand the impact of our carbon footprint on the environment. But the oil palm concessions and small Indonesian farmers, driven perhaps by selfish greed or desperation, continue to set fire to the forests and contaminate the atmosphere, offsetting the endeavors and sacrifices made by the rest of us. It's December now, and the Northeast monsoon has blown the haze away from Malaysia. The monsoon also brings a lot of rain especially in the east coast of Peninsula Malaysia. The weather is much better now in Malaysia, and everyone seems to have forgotten that for nearly two months we suffocated, our schools were closed and our health undermined by the haze. Meanwhile, the burning in Indonesia is still going on even as I type. If the Indonesian politicians continued to disregard the haze problem, the long term consequences of the fire would someday come back to haunt us all.